It was good to see Ms Mayawati in her strong way taking on the Sangh Parivar. She need to return to her old self. There is no need to read from written text in Parliament. It is time for her to now go back to cader and ask them to go for full blow. BJP’s attempted over enthusiasm to defame Mayawati for being ‘corrupt’ has boomeranged on them.Talk of fight against corruption only looked believeable from a person like V P Singh and none other in India atleast at the moment can claim that high moral ground. At least, the party of the corporate can not claim a high moral ground on corruption. Though BJP has sacked Daya Shankar for his absolutely outrageous comments against Ms Mayawati, a mere regret is not acceptable but he need to be arrested. 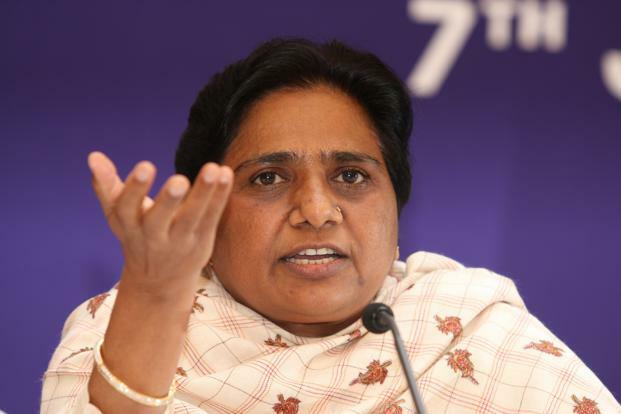 As Ms Mayawati spoke very well that he has insulted his sisters and daughters. It is not an upfront on her but on women of India and people will not forgive BJP for this, she added. A regret will not work, Sangh loudmouths have been abusing everyone who differ with them. They are not habitual of parliamentary language and curtsies..
Parliament must pass the resolution condemning him and any such attitude so that a strong message go the people particularly those who hold high offices or are in senior positions of any political party. He was not merely a ‘karyakarta’ as Arun Jaitley said in Parliament. He was one of the 15 vice presidents. But the fact is that all this did not come suddenly. Everyone in BJP and Hindutva party want to be like Modi and Amit Shah. They want to tell the world that they are bigger jumlebaaz. Every event has been converted to a street lumpenism hence we wish people clap on each word that we speak. How will people clap ? In a feudal caste ridden society, caste, colour, disability, gender, occupation become the biggest factors of our jokes. People love when we give ‘analogies’ and that is the crisis of India. We are speaking street language everywhere. The quality of a person is how much ‘clap’ he got. Politicians are habitual of speaking such dirt. Since, BJP is working overtime to divide Dalit votes in UP, it is functioning at multiple level. One, target Ms Mayawati being the most corrupt woman who take money and does not ‘respect’ politicians.Now they are ‘remembering’ late Kanshiram also but during his life time abused him. Now, we all know in Parliamentary democracy parties take money to field candidates. Mayawati might have her own problems like any other politician but to tell us that Mayawati is more corrupt than the Hindutva party or has more money than the ‘deshbhakt’ party and its leaders, will be the biggest joke of the century. So BJP’s leader and Sangh cadres have been told to start a whisper campaign with analogies that Mayawati is not ‘dalit kee beti but daulat kee beti’ as if only caste Hindus have got fundamental right to earn money, look good and enjoy luxuries. Nobody says any caste Hindu leader as ‘daulat ka beta’ or ‘daulat kee beti’ even when their declared asset runs in thousands of crores. Why these ‘honored’ fixed for Ms Mayawati. Is it because she is independent and has a mind of her own who dare to challenge the upper caste monopoly in the politics ? None asked the caste politicians of millions and trillions as how they earn their money? Ofcoures, they are ‘expert’ in placing things ‘according’ to law. In their zeal to attract people, BJP’s leaders have always crossed line and polarise people. They have been doing it with Muslims but now in Uttar Pradesh the Dalits are the biggest challenge for them hence they work on diverse agenda. Divide Dalits, distort history, play inter caste differences and patronise a few of those who are ‘dissatisfied’ with BSP. In public they continue to use such vocabulary. ‪#‎Ramzade‬-Haramjade, pachas crore kee girlfriend, ‪#‎prestitute‬, comparing killing of dalit children with dogs, Miya Musharraf, Bangladeshis, atankwadis, rastrdohis, deshbhakts, and many more, the Sangh school of ‘thoughts’ is working over time with these things regularly to bring new things in discourse and keep us busy. They are afraid because of political fall out of the things otherwise they would never have done things so quickly. Apart from apology, they sacked Daya Shankar because they know the damage is done. It is the power of Dalit votes that makes them take these steps half heartedly otherwise they dont care. We know the hate brigade on the social media. I can bet one hundred percent many of their ‘experts’ will be using foul language in their whatsapp and facebook groups. It is not that Arun Jaitley has regretted and things have ended. The multiple voices theory work in Sangh Parivar to keep their diverse caders happy. So, many will justify and bring other ‘stories’ while others will pacify and say sorry. That is why we say, it is not enough to say sorry. Parliament need to pass a resolution condemning such kind of language in our social political life. We are facing it daily on social media and they are justifying it. I salute to all those people who are being abused on twitter Delhi by these lumpens for their bold stand. I have faced it many times from them and expect to face in future too. We know it well but we dont want to get engaged with those who have closed mind. When Dalits in Gujarat have now decided to take the Hindutva head on, when people are agitated in Maharastra over illegal demolition of historical House and printing Press of Baba Saheb Ambedkar, the foul mouth leaders ranting against Ms Mayawati gives an opportunity to people to unite and defeat such forces in Uttar Pradesh.